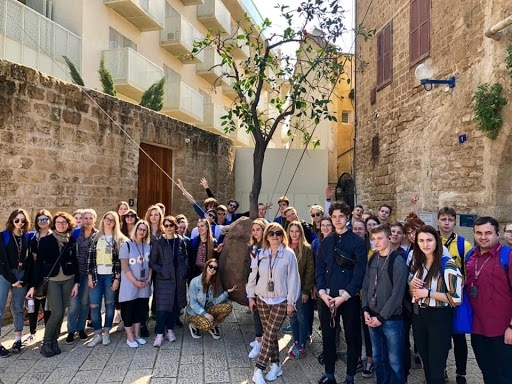 Forty five students from Alytus, Marijampole, Prienai, Birstonas, Kaunas and Varena had an opportunity to spend a week in Israel this February. The initiative of the Embassy of Israel in Lithuania was launched last year with a goal to "build bridges" between Lithuania and Israel. 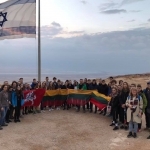 It started last spring with Lithuanian students travelling to Israel, and last fall Israeli students visited Lithuania. The Kazickas Family Foundation, investing in youth for 20 years already, encourages building relationships, sharing experiences and working together while reaching for common goals, proudly supports this initiative. “This project like many other Embassy activities is all about people and human bridges. I urge pupils to use all their senses while exploring what Israel is all about. Youth exchange is an important way to bring our people to know each other better,” said Amir Maimon, Ambassador of Israel to Lithuania. 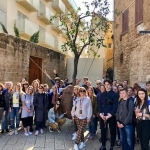 "On the 11th of February, students from 6 different cities – Kaunas, Birštonas, Prienai, Alytus, Marijampolė and Varėna went on a trip to Israel. However, this trip did not begin on the 11th, it began much earlier. You didn’t need strong math or chemistry skills to be selected for this project. The most important thing was to know how to represent your country. Additionally, English language skills played a major role in the selection process. An important criterion selecting participants from Alytus was participation in projects associated with Jewish history. I created a short documentary about the Jews of Alytus. The rest of the members of the delegation of Alytus attended the theatre play “Paskutiniai Vilniaus žydai“ (The last Jews in Vilnius). Selected participants where introduced to the mission of the trip. The Ambassador presented us with the plans and objectives of the journey. Finally, we arrived to Israel and began our journey. Something incredible happened on the very first day : I got to meet a person who’s story was featured in my film. I met Saadia Bahat, the son of Mendelis Bokšickis. The meeting with him was a true history lesson. We learned so much from his life story during the war. 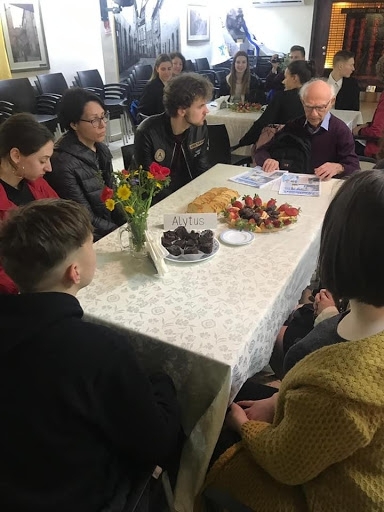 He told us how he found his uncle at the Stutthof concentration camp, how he was waving to Antanas Smetona from the Juozapavicius bridge in Alytus when he was a child. During the trip we visited three schools and had a chance to compare them with the Lithuanian schools. The architecture there is different. While in our country we have one closed building, there you see a large area with several separate buildings. One of those schools was Ein Karem, an agriculture school resembling the vocational school here in Alytus. It was fascinating to learn how it works, check out their gardens and livestock. This journey inspired me to research the history of my own country, as well as of Israel. Before this trip all I knew about Israel was from my school text book. Visiting the Yad Vashem, the World Holocaust Remembrance Center, was truly an overwhelming lesson on the Holocaust and war. We need to learn from the history and never let atrocities like this happen again. During the evenings we, as a group, shared our experiences and thoughts of the day. This trip gave me motivation to do more research on Jewish history and its footprint left on our country’s history. Together with few new friends I’ve made I continue this journey in Lithuania. There is an old Jewish cemetery near my home. Some of the graves must be around two hundred years old. I never thought much of it until now. After this trip I went back there with a new mission. I took pictures of the headstones that had the clearest engraved texts and sent them to the students I met in Israel asking to translate the inscriptions in Hebrew. Now I know the names of the people laid there for their eternal rest. 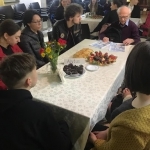 Our school is planning an initiative to clean up the cemetery during the American and German students’ visit here in June. 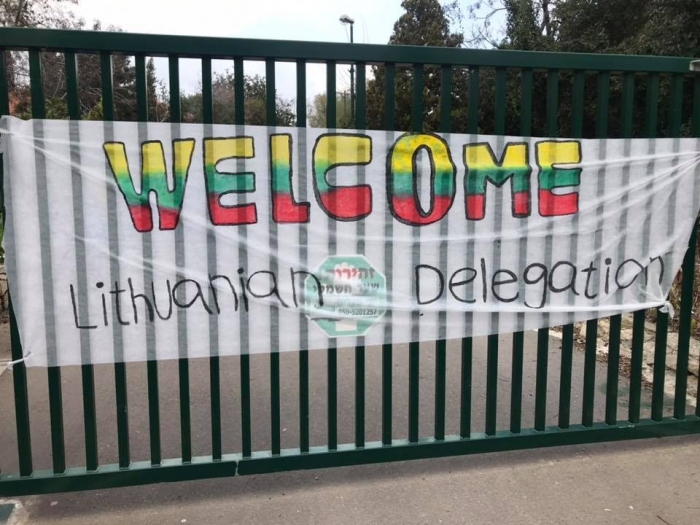 Lithuania was always on our minds during the trip to Israel. 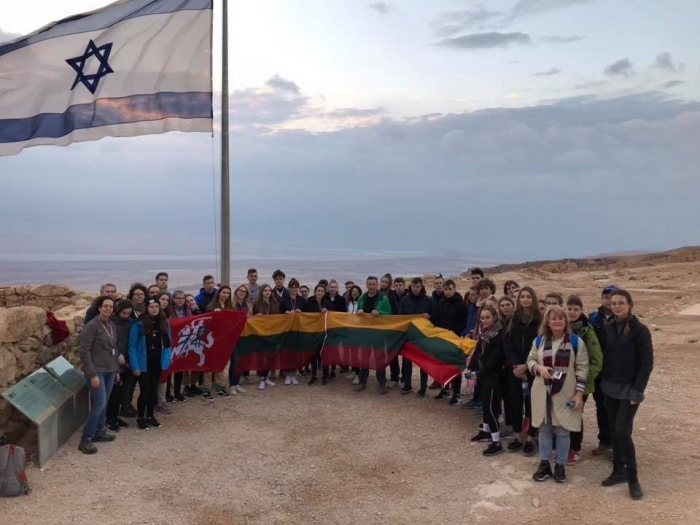 On the 16th of February we gathered on the peak of the Masada plateau for the Lithuanian national anthem. During my trip to Israel, I realized the importance of traditions and the commandments of the Torah in Israeli culture. It doesn’t matter if you are religious or not, these commandments are universal and I wish to follow them back at home. Our journey didn’t end with this trip. Now I take care of the graves at the Jewish cemetery and try to collect as much information as possible about the people buried there. Our journey was broadcasted on LRT TV and 15min.lt shared our story as well. My team and I shared our experiences during the presentation at our school and with the representatives of our local government. This trip to Israel strengthened my patriotism, my love for my Homeland and a wish to make it a better place, the same way the Israelis feel about their land." 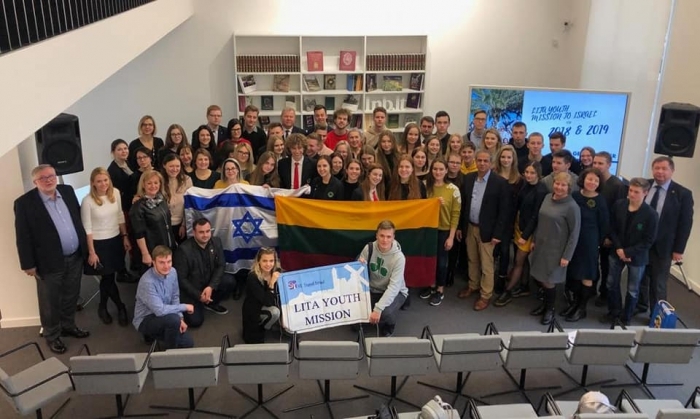 Since the very opening four years ago, the Embassy of Israel has been continuously engaged in a variety of bridge-building activities between Lithuania and Israel. Among them, the embassy's projects focused on children and youth have always been given a top priority.